Huawei sub-brand Honor has now announced that the Honor View 20 pre-booking in India will start from January 15. The smartphone is set for launch on January 29, and ahead of that, the company has published a dedicated page on Amazon, confirming the India pre-booking dates for the Honor View 20. For those unaware, Honor View 20 is the global variant of the Honor V20 launched in China last month. Its key highlight is the display hole for selfie camera, dual camera set up at the back, and a 48-megapixel sensor. The Amazon listing suggests that the Honor View 20 pre-booking in India starts from January 15 and go on till January 29. The company is offering free Honor Sport BT earphones to all customers that pre-book the device. In order to avail this offer, head to the Honor View 20 gift card page on Amazon India, choose the denominator of Rs. 1,000 and purchase the gift card. The gift card will be emailed to the user, and on January 30 when the sale begins, the user can purchase the Honor View 20 from the same account as the gift card purchase. After the purchase, Amazon will then email the coupon code for the free Honor Sport BT earphones by February 15. Users can then grab the earphones for free from Amazon by entering the coupon code at checkout. 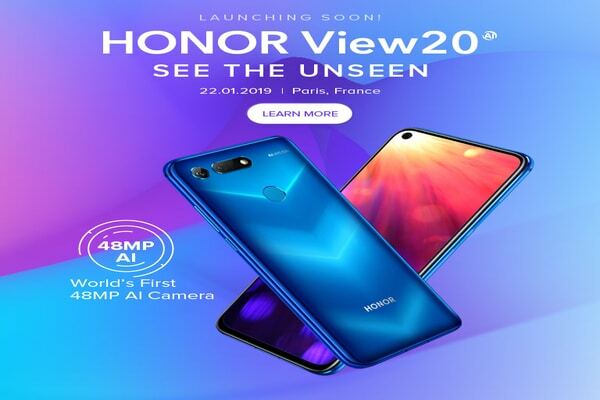 As for the HiHonor India store, the Huawei sub-brand is also hosting Honor View 20 India pre-bookings on its own site. The same Honor Bluetooth earphones will be offered, while interested customers will have to pay the same Rs. 1,000 to pre-book – using the Honor View 20 Pre-Book Coupon. The amount is redeemable on purchase. The pre-booking for the Honor View 20 starts on the same day as the launch of the Honor 10 Lite in the country. This phone features a waterdrop notch, a dual camera set up at the back, is powered by the Snapdragon 710 SoC, and packs a 3,400mAh battery. This phone is set to be available exclusively on Flipkart. Honor India is yet to officially announce the price of the Honor View 20, but the China price of the phone does offer some indication on what we can expect. The Honor V20 starts at CNY 2,999 (roughly Rs. 30,400) in China for the 6GB RAM + 128GB storage option. The price goes up to CNY 3,499 (roughly Rs. 35,500) for the 8GB RAM + 128GB storage option and CNY 3,999 (roughly Rs. 40,600) for the Moschino Edition. Considering that the Honor View 20 is the global variant of the Honor V20, it is expected to pack identical specifications to those of the Chinese model. In terms of the software, the View 20 runs Magic UI 2.0 based on Android 9 Pie. The Magic UI is very similar to its predecessor the EMUI, apart from a new color scheme, real-time in-call voice translations, and more.